Jim Hammond replaced seven frames on this 16 x56" motorboat, repaired the lower transom, refinished the motor (1958 Big Twin Evinrude) and installed a new windshield. Then he gave it a few (9) coats of varnish. 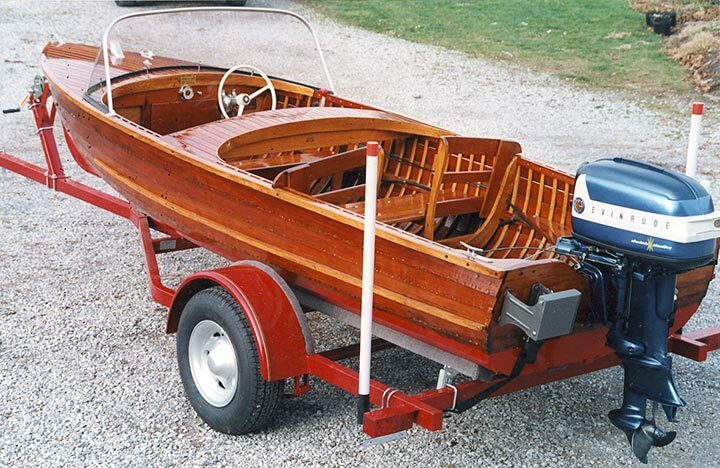 Johnson Boatworks of St. Williams, Ontario, built the boat in 1957. He re-launched it in May of 2001 and named it SURVIVOR. Contact Jim at Inner Bay Boats 27 East -+ line Road, St. Williams, Ontario, Canada N0E 1P0. www.innerbayboats.com or jfhammond@kwic.com.